We are a prominent Exporter and Supplier of Mobile Communication Trainer Kit. 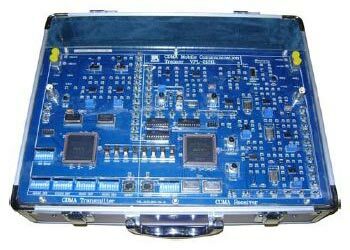 VPL-2131L provides a basic understanding of the concepts of CDMA and various issues of a DSSS system. These include the usage of pseudorandom (PN) codes and digital modulations BPSK. It has digital modulation & demodulation along with direct sequence spread spectrum (DSSS) generation and decoding, data signals, zero random bit signal generation. Acquisition and tracking, synchronization extraction, error correction encoding. Acquisition and tracking of pseudo-random sequence, bit synchronization. Frame synchronization extraction, carrier recovery, error correction coding and encoding.